123 Kids Fun SNOWMAN - Your very own snowman as adorably or as silly as you want! A fun time winter activity that families have enjoyed for years is making snowman. What better way to get in to the season’s spirit than by going outside on a crisp winter morning and building a snowman with pure white snow, an arm full of ornaments, and family. Now your toddlers and young children can bring that feeling back home with 123 KIDS FUN SNOWMAN. With more than a hundred different accessories, you can dress your very own snowman as adorably or as silly as you want. 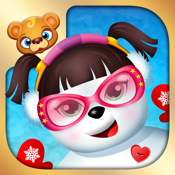 Dress up and decorate your snowman, make photos and show to your friends and family.